When the real world becomes too much, or if the real world starts taking things that you love away from you what do you do? Fight against it? Go with the flow? Or would you retreat and hid in a shell? Sometimes it helps when you’re down to have someone there to talk to. To be able to release some of the tension that builds up from too much stress. For some there just isn’t anybody to talk to, like Samantha Moore in the book “Dear. Mr. Knightley” who didn’t have anybody to talk to. No family, hardly any friends, except her fictional characters from her favorite Jane Austin, Charles Dickens books. To Samantha, Elizabeth Bennett, Emma Woodhouse and Fitzwilliam Darcy (or Mr. Darcy) they were her heroes. These characters that have faced tough times in a tough world always had something to say, some type of advice that became the voice for Samantha. But it gets kind of boring when the conversation is one sided. So when an opportunity of a life-time comes along to go to one of the greatest Journalism colleges with Full Tuition all paid for with one perk: write letters to the anonymous benefactor who calls himself “Mr. Knightley” about Samantha’s progress. To be honest, Samantha was quite skeptical about writing letters to a complete stranger plus she is to never receive letters back. At the start, Samantha almost doesn’t go through with it. But once she found that writing to someone, voicing her days and progresses in school, actually helps her release her tension about school and about life as well seems to bring her out of her shell and be able to face the real world with her OWN voice. Not Elizabeth Bennett’s voice or Mr. Darcy’s voice speaking for her, for this time she’s speaking from her own experience, her own voice and Samantha has found that her voice has something special to say to those around her. Only question is, is the world ready to hear Samantha’s voice? 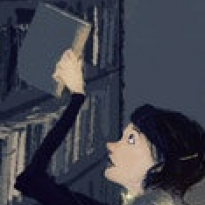 A wonderful story about a young woman who all her life lived through tragedy found comfort in her books and stayed hidden for so long she forgot how it feels and mean to live in the real world until an unknown benefactor helps her find her voice through actual letters. Not email, not instant text messages, not even Facebook was what she needed. The actual form of writing letters, mailing them day after day is what helped Samantha come out of her shell. When I was little, my hero at that time was my big brother, Rich. He was always ready for whatever the world tossed at him and always curious of what the world could offer him. He was super excited that his little sister was just as curious as he was, so what does a big brother to do? Send advice, give encouragement and since he lives in another state, letters is how we stayed connected. And we still do to this day. A little Postcard, or a quick letter here or there and that’s how we helped each other get through the hardships that life brought us. If you find that someone who could help you, or haven’t seen/talked to for a while, write a letter to them. You never know, they (or even you) might be living like Samantha Moore, hiding in their shell. You never know. 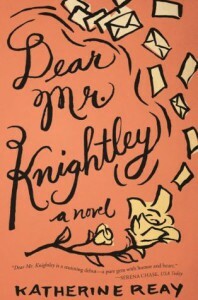 Check out “Dear Mr. Knightley” at your local library.